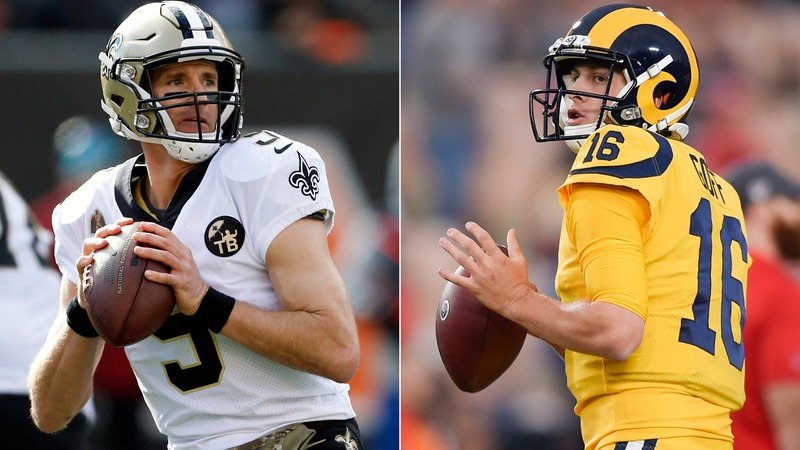 The betting trends say Sunday's Rams-Saints rematch for the NFC Championship has all the makings for another shootout but recent statistics from Jared Goff and Drew Brees indicate the game could be a grinder. [The betting trends](https://www.betchicago.com/nfl-playoffs-2019-betting-lines-ats-trends-picks-patriots-chiefs-rams-saints) say Sunday's Rams-Saints rematch for the NFC Championship has all the makings for another shootout but recent statistics from Jared Goff and Drew Brees indicate the game could be a grinder despite a consensus total of 57. The Rams and Saints combined for 80 points and 970 yards in the sixth-highest scoring game of the 2018 season in Week 9. The Saints (then 2-point underdogs) never trailed as they handed Los Angeles its first loss of the season in a 45-35 shootout (OVER 58). Sunday's NFC championship game has a similar total but the favorites are flipped, with the Saints currently a 3.5-point favorite at several sportsbooks. The total has dropped to 56.5 at the South Point and respected offshore sportbook Pinnacle, indicating the market may shift down a half-point. We think it's a correct move given both teams have leaned on the run with their QBs seemingly regressing after peaking mid-season. __MORE:__ [Oddsmakers, sharps expect New England's road woes to continue in AFC Championship](https://www.betchicago.com/patriots-chiefs-betting-lines-pick-trends-sharps-preview-afc-championship) From Weeks 1-12 the Saints were scoring 4.4 TDs per game, but ever since, they are relying on the run more than ever and have seen their TD average cut in half to 2.2 per game the last six contests. [Brees' arm strength](https://twitter.com/SportsSturm/status/1085326766460280832) has been brought into question as he's he’s thrown five TDs over his past five games and has been intercepted six times in the past seven games after throwing one in his first 10 games of the season. <a href="https://twitter.com/FO_ScottKacsmar/status/1084640909352931329" class="embedly-card" data-card-width="100%" data-card-controls="0">Embedded content: https://twitter.com/FO_ScottKacsmar/status/1084640909352931329</a> Brees had an adjusted QBR above 66.0 just once in the past five games and the same can be said for Goff, who has averaged just 26 pass attempts over the last three games with his offense running the ball on 61.2 percent of their offensive plays, [according to](http://www.rotoworld.com/sports/nfl/football) Rotoworld. Goff has averaged 221.2 passing yards (6.3 yards per pass attempt) the past six games, while throwing one or fewer TDs in five of six. Outside of the Saints game, he's been average at best on the road this season with a QB Rating of 82.7 [compared to](https://www.pro-football-reference.com/players/G/GoffJa00/splits/2018/) 116.7 at home. Goff’s yards per attempt also dropped from 8.8 with a 22:3 TD:INT ratio at home to 7.6 with a 10:9 ratio on the road. In part due to each QB regressing and relying more on the run, the UNDER has been the correct betting selection in five of the last six Rams road games and six of the past eight Saints games. ## Rams at Saints odds and betting lines Sunday 2:05 p.m. CT on FOX; Odds provided by Westgate __Point spread:__ Saints -3.5 (even) __Total:__ 57 __Moneyline:__ Rams +150, Saints -170 __Line movement:__ It's worth pointing out that when these teams met earlier in the season the Rams were a 2-point road favorite. Now the Rams are 3.5-point underdogs. A swing of 5.5 points indicates there is line value on the Rams and the Westgate has taken sharp money on the visitors early in the week, oddsmaker John Murray said on his weekly radio hit with VSiN. The current point spread sits at Saints -3.5 even money, while the South Point, whose policy is to never deviate from -110 odds, currently lists the Saints at -3 as of Thursday's writing. The total has remained between 57 and 56 at Nevada sportsbooks and 56 percent of the betting market has tickets on the OVER, [according to](https://www.sportsinsights.com/nfl/) Sports Insights. ## Rams football betting records SU record: 14-3 ATS record: 8-8-1 O/U record: 9-8 Rams road record: 6-2 SU, 4-4 ATS, 6-2 to the UNDER The Rams struggled with top opposing WRs this season, allowing 7.4 catches for 82.7 yards per game ([28th DVOA](https://twitter.com/Ihartitz/status/1085890448043003904)). Michael Thomas hauled in 12 catches on 16 targets for 171 yards and a touchdown against the Eagles and is a big threat to repeat against the Rams. <a href="https://twitter.com/FO_ASchatz/status/1085329964344455173" class="embedly-card" data-card-width="100%" data-card-controls="0">Embedded content: https://twitter.com/FO_ASchatz/status/1085329964344455173</a> __Note:__ These are the [Football Outsiders'](https://www.footballoutsiders.com/) team efficiency ratings for the 2018 season, measured by their Defense-adjusted Value Over Average (DVOA) system that breaks down every single NFL play and compares a team's performance to a league baseline. L.A. also struggled to defend the run this season and with speculation of Brees' arm strength dwindling, the Saints could rely on the run more than ever. <a href="https://twitter.com/Ihartitz/status/1085245267862081537" class="embedly-card" data-card-width="100%" data-card-controls="0">Embedded content: https://twitter.com/Ihartitz/status/1085245267862081537</a> ## Saints football betting records SU record: 14-3 ATS record: 10-7 O/U record: 7-10 Saints home record: 7-2 SU, 4-5 ATS, 5-4 to the OVER. We know the Rams rush offense against the Saints rush defense is a [strength-on-strength matchup](https://twitter.com/geauxcrypteaux/status/1085422097550200832) but if the Saints truly are to slow the Rams offense they need to force pressure on Goff. The Rams QB, who has thrown one or zero TDs in five of his last six games, has completed just 43 percent of passes this season when under pressure. He ranked 28th among 38 qualified QBs in PFF’s under-pressure passer rating (59.8). The Saints [failed to sack Goff in Week 9](https://www.youtube.com/watch?v=aaIyy109Hf8) and recorded just five QB hits. New Orleans never sacked Eagles QB Nick Foles and generated just four QB hits. The Saints must find a way to generate pressure on Goff and force him into quick decisions if they are to slow the Rams offense. If not, Goff is going to find Robert Woods, or whomever is being shadowed by corner P.J. Williams ([56.4 PFF grade; 103rd among CBs](https://www.profootballfocus.com/nfl/players/pj-williams/9511)) and pick him apart. __MORE:__ [Look-ahead lines for the four possible Super Bowl 53 matchups](https://www.betchicago.com/super-bowl-53-odds-betting-lines-spreads-totals-vegas) ## Rams at Saints betting trends &bull; Home teams are 10-0 SU and 9-1 ATS in the conference championship round the past five seasons. &bull; OVER is 6-1 in Saints' last seven playoff home games and is 6-2 in Rams' last eight games vs. a team with a winning record. &bull; Saints are 15-2 SU in their last 17 games at home. &bull; Saints are 2-9 ATS as home favorites in the playoffs and 0-6 ATS as playoff favorites of less than a touchdown. &bull; The Rams have lost and failed to cover all eight games Bill Vinovich has officiated since 2012, including being 0-2 SU and ATS this season (Week 9 at Saints, Week 15 vs. Eagles). ## Rams at Saints betting pick __Rams +3.5__ I think this is going to be the tightest game of the conference championship round and I will take all the points I can get. The 5.5-point swing on the spread screams value to me. What have the Saints done of late to deserve it? They needed a fake punt and dropped pass late to beat the Eagles and I honestly believe Brees' arm strength has gotten weaker since Thanksgiving, which is the last time I have been impressed with the Saints offense. Since the previous matchup, the Rams now have CB Aqib Talib back and a rejuvenated C.J. Anderson to complement Todd Gurley in the running game. With [Sheldon Rankins (Achilles) out](https://twitter.com/RodgersBC/status/1085999412747403275) on the Saints d-line, New Orleans' strong rush defense takes a big hit and I think the Rams will control the time of possession battle this time around in a tight, lower-scoring game. I also lean to the UNDER. __Play and win:__ [Join our NFL prop contest](https://betchicago.chalkline.com/games/sunday-nfl-challenge) for a chance to win a BetChicago Prize Pack!